I am the daughter of a Romanian mother and an Iraqi father who met in the Israeli army and immigrated to Los Angeles, where I was born and raised. My culinary upbringing has been equally eclectic. One grandmother used parsley; the other, cilantro. One cooked potatoes; the other, rice. On family visits to Israel when I was a child, I watched my Romanian grandmother stretch translucent dough over the kitchen table for a delicate apple strudel, and my Iraqi grandmother fashion miniature meat-filled semolina dumplings with breathtaking dexterity. I ate steak hot off the grill in the avocado orchard of my farming family’s moshav (collective farm), and long before the resurgence of farmers’ markets in the United States, I accompanied city-dwelling aunts to the outdoor market (souk) to do the weekly shopping. Back in Los Angeles, my family and I explored the foods of my parents’ adopted, and my native, homeland. I couldn’t have known it then, but these are the experiences that utterly defined my approach to food: an abiding admiration for family farmers, a love for globally diverse and bold flavors, and an understanding that the connections between past and present bring a delicious sense of continuity to contemporary life. Writer, teacher, and award-winnging author of The Seasonal Jewish Kitchen: A Fresh Take on Tradition and The Santa Monica Farmers’ Market Cookbook: Seasonal Foods, Simple Recipes, and Stories from the Market and Farm, Amelia Saltsman is passionate about helping everyday cooks make the connection between small-farmed foods and real-life meals. In her warm style, Amelia streamlines today’s desire for healthier, sustainable foods; the need to get dinner on the table; and the longing for rich holiday traditions into one seamless whole. Amelia’s name is synonymous with intuitive, seasonal cooking, and her food reflects the bold, diverse flavors of her eclectic background. Amelia’s books have made numerous “best” lists, including The Washington Post, Cooking Light, and KCRW’s Good Food, and she has been featured in such diverse outlets as Parade Magazine, Yahoo! Food, Food52, Fit Pregnancy, Vegetarian Times, US Airways, USA Today, Jewish Chronicle of London, The Jerusalem Post, and Los Angeles magazine. 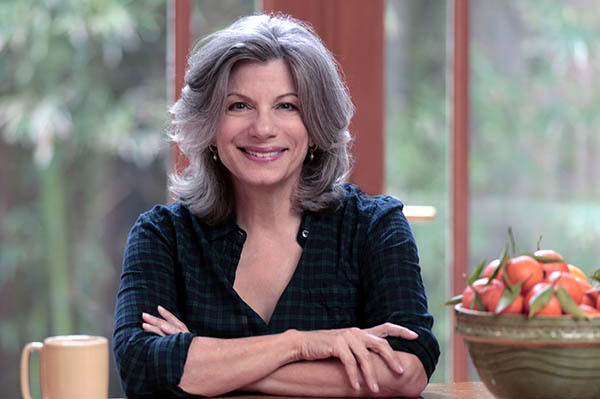 Her work has appeared in Bon Appétit, Los Angeles Times, Washington Post, Boston Globe, Food52, The Kitchn, Cooking Light, Huffington Post, Jewish Journal, National Geographic Traveler, and more. Amelia is a frequent guest on KCRW’s Good Food and has appeared on Hallmark’s Home & Family and Good Day L.A. Known as an energetic and inspiring teacher, she teaches at such venues as Google’s corporate offices and Rancho La Puerta. A long-time champion of local family farms, fair food, and farmers’ markets, Amelia is committed to raising the food literacy rate: knowing how, where, and by whom our food is grown; knowing how to cook a simple, healthy meal; and understanding the historical, local, and global impact our food choices have on our families and communities. Amelia served ten years on the California Certified Farmers’ Markets Advisory Committee and Direct Marketing Task Force; contributed to The Sage Encyclopedia of Food Issues; and empowers people to confidently “read” their farmers’ markets. 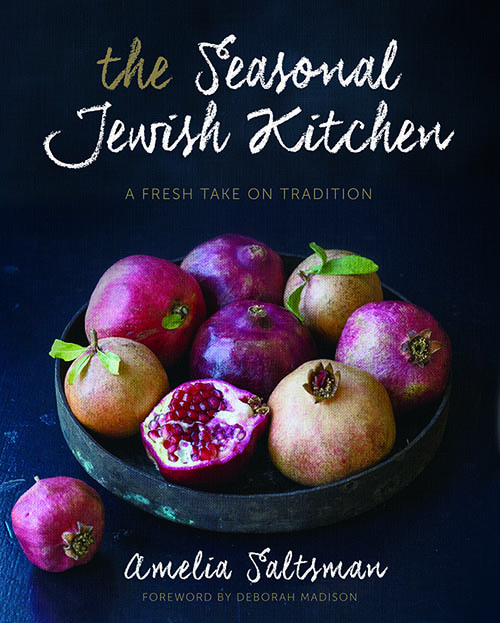 Already in its second printing, The Seasonal Jewish Kitchen is included in The Washington Post‘s Highly Recommended Cookbooks of 2015; National Public Radio Here & Now 2015 Favorites; Zester Daily’s Top 5 Jewish Cookbooks; LA Weekly’s 10 LA Cookbooks for Foodies; and is a 2015 KCRW Cookbook Club selection. The book received a Nautilus Gold Book Award, a starred review in Library Journal, and was a Books for a Better Life finalist. The Seasonal Jewish Kitchen is consistently an Amazon #1 bestseller in its category. In 2006, Amelia founded Blenheim Press to produce her first book — and beloved classic — The Santa Monica Farmers’ Market Cookbook, now in its sixth printing. Named one of the Top 100 Cookbooks of the Last 25 Years by Cooking Light, it tells the story of passionate California growers and their extraordinary crops, and is a great market guide and cookbook with universal appeal. The book has received other accolades, including the Santa Monica Library Green Prize for Sustainable Literature, the Writers’ Digest Grand Prize for Self-Published Books, and a PubWest Book Design Award, and was translated into Braille in the United States and Canada. 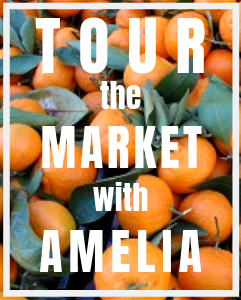 Following her groundbreaking success self-publishing The Santa Monica Farmers’ Market Cookbook, Amelia was an early e-cookbook pioneer with the release of The Santa Monica Farmers’ Market Cookbook Summer Entertaining Ebook in 2012. A Los Angeles native, Amelia and her husband Ralph raised their three children on the Westside, and now enjoy watching their grandchildren’s budding appreciation for their family’s food traditions and delicious seasonal bounty.